Web Developer spending each day wrangling front and back-end code - helping keep Genuitec on the web. 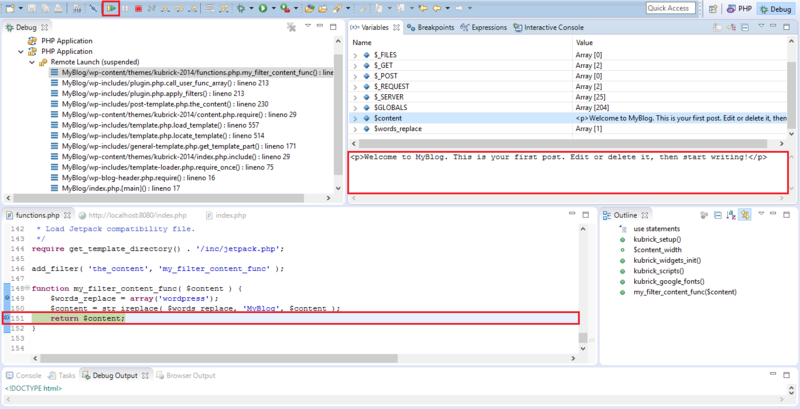 If you code PHP and are tired of fighting logging messages, Eclipse PHP Development Tools (PDT) can end the fight! Using Eclipse PDT to debug PHP isn’t as hard as you might think. Read on to see how a few simple steps can make your coding life so much easier! Our portal uses WordPress, a powerful content management system (CMS), and we have written many custom plugins with specific requirements for our company. In the beginning, a debugger wasn’t necessary. But, as functionality got complex, we needed to find an easy way to debug PHP. This search lead us to a real time saver—Eclipse PDT along with Xdebug. Now we just use breakpoints and watchers to debug instead of the tedious task of printing out data and debugging the error log file. 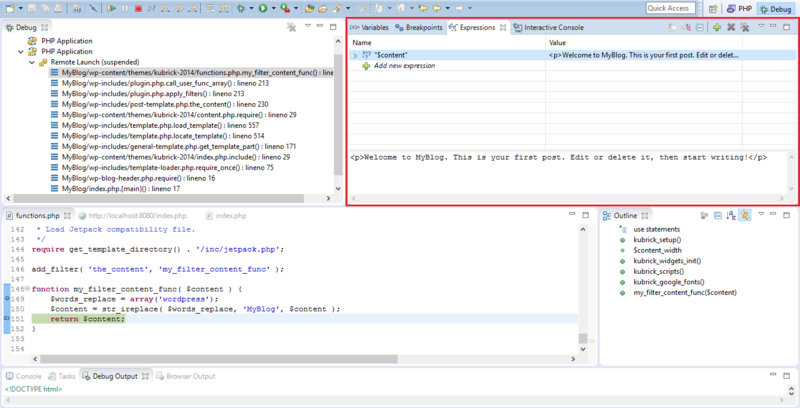 Before you start debugging, you will need to install Xdebug and configure your project in Eclipse. 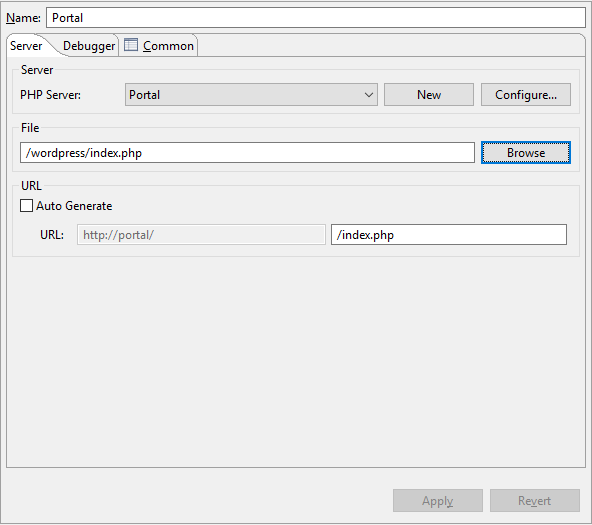 This installs the xdebug extension in the default php extensions directory, setting it enabled by default. In Windows, I like to use Xampp. After installing it, Xdebug is pre-configured in the php.ini file. To enable Xdebug, remove the semicolon ( ; ) to uncomment the line that manages the setup and settings. 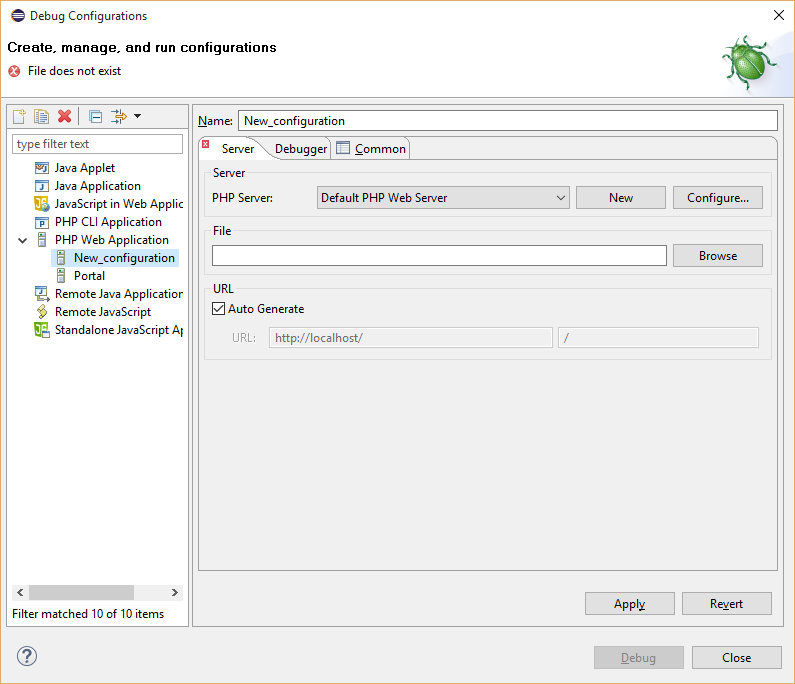 Complete the following steps to configure a PHP project in Eclipse for debugging. Create a new project using the location of the current WordPress location. Click the Debug drop down arrow and select Debug Configurations. Name—Type a name for the server. Base URL—Type the URL for your local domain test. Local Web Root—Set the path of your web root. 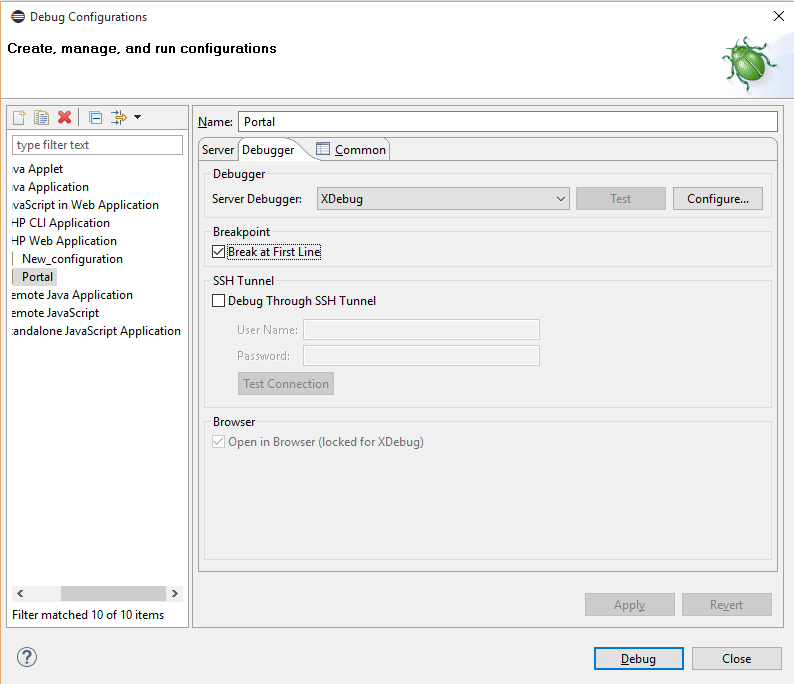 Click OK and return to the Server tab on the Debug Configurations window. Select the PHP file to debug (the file from which the program starts). 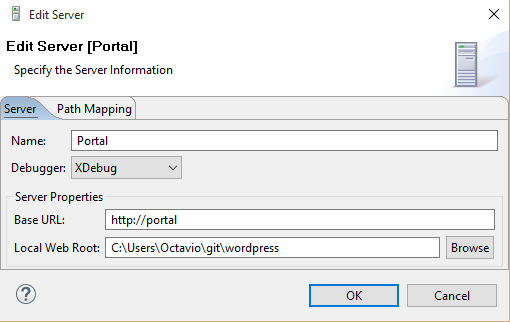 Note: I configured my virtual domain ( ‘portal’ ) to load content in C:\Users\Octavio\git\wordpress, so I had to disable Auto Generate and remove ‘wordpress’ from the path. Click the Debugger tab and make sure XDebug is selected as the Server Debugger. Optionally, you can set a breakpoint at the first line of code. Now, follow these steps to debug something basic but useful. Set a breakpoint on the first line of the function and a second breakpoint on the last line (return $content;). Click Debug and notice that execution stops at the first breakpoint. Also note that we have access to the program variables, in this case the important one is $content. Click Resume or press F8 to continue the program execution. The program execution now stops on the second breakpoint. Sometimes we find a bottleneck in our application and don’t know which function is causing it, that’s when adding a profiler to our scripts comes in handy. Xdebug provides great data for profiling PHP and is easy to use. xdebug.profiler_output_dir—The path where the profiles are saved. xdebug.profiler_append—If On, adds the data at the end of the file instead of replacing last profile. xdebug.trace_options—If 1, appends the traces instead of overwriting. xdebug.collect_params—Specifies if we want to consider the parameters in functions. We use 4 for a full variable contents and variable name. See more options. xdebug.collect_return—If 1, XDebug writes the returning value of functions calls to the trace files. Make sure Apache has read and write permissions to the profile’s directory. I hope you are able to put this information to good use. Debugging this way has certainly saved us a lot of time (and also headaches!). It may seem confusing at first, but once you have it configured properly you will find the time spent setting up was totally worth it.